Sign up for the AALP newsletter! Get your FREE reading and spelling resources! 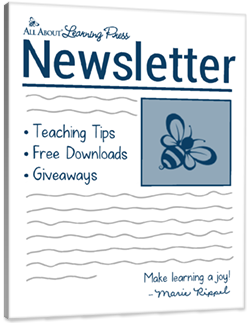 Be the first to know about our handy teaching resources, giveaways, and special announcements! Our weekly newsletter is jam-packed with valuable information. You'll be the first to know about our latest blog posts, free downloads, giveaways, and special announcements. We provide practical tips and advice for teaching children of all ages and abilities—including struggling learners. 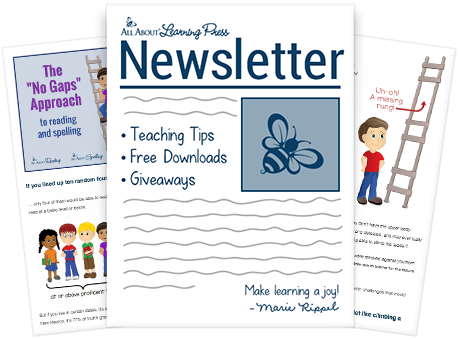 Whether you’re teaching a preschooler, an older student, or someone in between, our newsletters will equip you with effective strategies for teaching language arts so you can help your child reach his or her full potential! How our "No Gaps" curriculum is helping children achieve success in a wide variety of homeschool classrooms. Handy tips and tricks for teaching tough reading and spelling concepts. Advice and encouragement from fellow homeschoolers. Free educational downloads that your kids will love! We look forward to getting to know you! You can email us at support@allaboutlearningpress.com, or call us at 715-477-1976. No question is too big or too small—we’re here to help.